Elegant Touch Nail Clippers are great for cutting your nails into the perfect shape. Elegant Touch Nail Clippers have a high quality design and with there state of the art precision cutting technique they will glide through nails with complete easy and accuracy. Top nail care experts from Elegant Touch have put nothing but pure care and attention into formulating these Nail Clippers allowing you the piece of mind for a gentle clear cut every time. 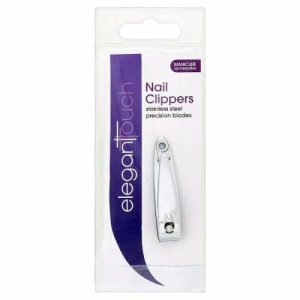 Elegant Touch nail clippers are made from high quality stainless steel and have precision engineered blades. The handy pocket size clippers, along with the nail file, make these an essential manicure accessory. Never cut into the corners, as this can damage and weaken the nail.